1. Read up. Kick off your green habits by reading a “Saves the Planet” Frecklebox bookthat gives helpful conservation tips kids can use—from turning off the lights to riding bikes to school. Your children will want to read the personalized story over and over again, and the information will be more likely to stick. 2. Recycle. Explain to your kids that tossing a soda can or a water bottle in the garbage can will lead to unnecessary trash piling up in landfills. Show them which materials can be recycled instead of thrown away, and put the kids in charge of separating the contents of the bins. 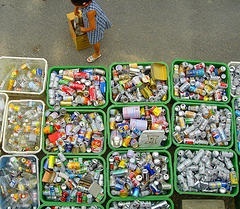 If your state offers rewards for each recycled item, recycling can be a fun and easy allowance supplement. You can also channel your creativity into Earth-friendly recycled craft projects. 3. Unplug and turn off. Many households can reduce their energy consumption by simply unplugging electronics and turning off lights that aren’t in use. Make it into a scavenger hunt with your kids to see who can find the most ways to unplug and turn off, from cell phone chargers to coffee makers. Point out which appliances are important to keep plugged in all the time (like the refrigerator and clocks). 4. Compost. Composting is easier, more accessible and less messy than many people think. It is a wonderful way to show children how organic kitchen waste (banana peels, eggshells, apple cores, etc.) can be transformed into rich, natural fertilizer for your garden. Adding earthworms to a compost bin can break down garbage faster and reduce odors (plus, your kids might get a kick out of them). Read more about home composting and how to make a compost bin out of a few simple materials. 5. Start with the Small Stuff. Every little bit helps, so start with small changes and move toward bigger projects. Set a good example for your kids, and soon the improvements will become part of your family’s routine. Conserve water. Turn off the faucet while you’re brushing your teeth, cut a few minutes off your morning shower and use water sparingly when gardening. Bring your own bags. Keep a few reusable cotton bags near the front door or in the car so you have them handy when grocery shopping to avoid using plastic bags. Leave the car. Walk or ride your bike for nearby errands or outings. You and your kids will get exercise and fresh air, and you’ll cut back on harmful greenhouse emissions. Ditch the dryer. In warm weather, hang laundry on a line outside to dry instead of using the dryer for each load of clothes. Keep a stepstool near the line so the little ones can help. How does your family go green? Leave your ideas in the comments.